Bored and near a colony of bees? We've got just the hobby for you: bee bearding. Humans share an intimate history with bees, having hunted and gathered their sweet honey as far back as 13,000 BC. It only seems natural, then, that this close association would eventuate into donning their winged friends as…beards. 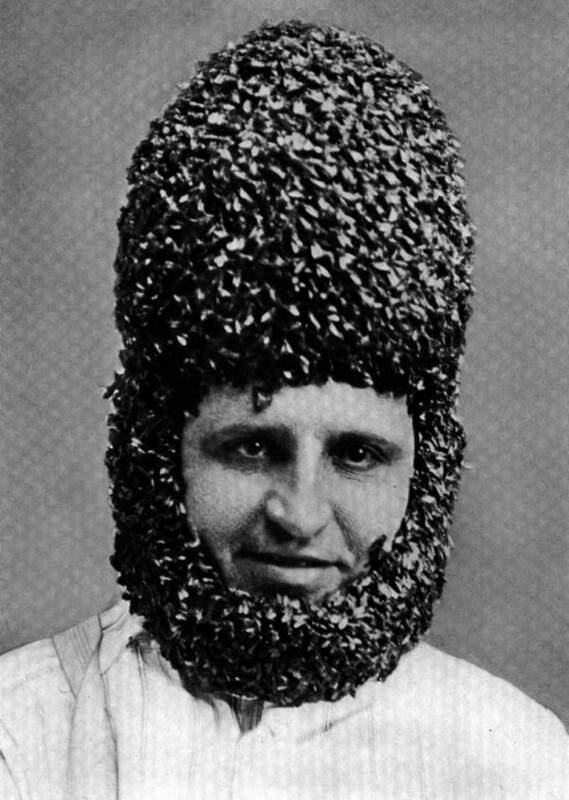 The practice – aptly named bee bearding – has been a mainstay of the beekeeping world since the nineteenth century, often as a sideshow in carnivals. In doing so, bee bearers have sported hundreds and thousands of honey bees on their faces, though in recent times more have taken to rocking bees all over their bodies. It is a well-known fact that beekeepers have historically allowed bees to rest on their bodies as a way to illustrate rapport with their charges. But it truly became prominent in 1830, thanks to Ukrainian beekeeper, Petro Prokopovych. 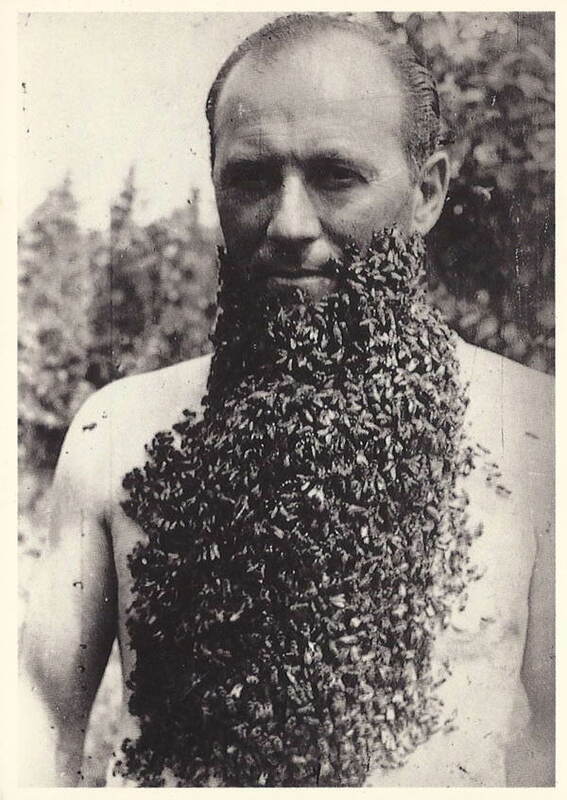 The practice eventually began to spread throughout the world, and by the end of the nineteenth century bee bearding was a regular feature at carnivals throughout America. 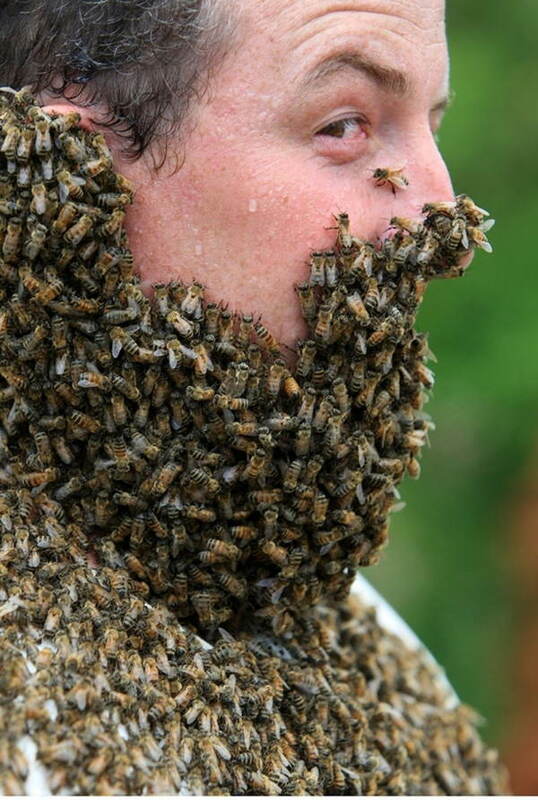 While bee bearding might look like quite an elaborate pastime, its execution is actually quite simple. Every colony has a queen that they recognize by smell. This queen – usually a young one because her scent is more potent to her colony – is placed in a small plastic cage that is tied around the bee bearder’s neck. section of the honey bees is separated from the rest of the colony, and once those bees catch the scent of their queen, they begin to huddle around the cage. 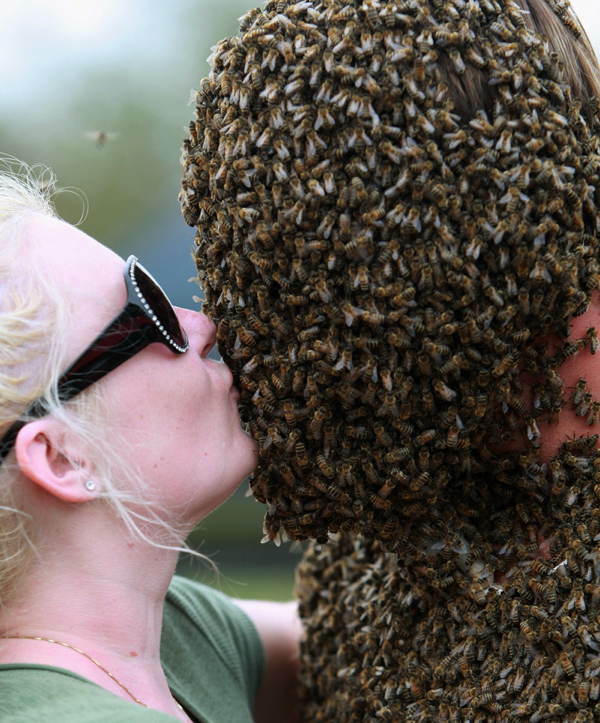 Thus, a bee beard is formed. The queen and her small selection are often separated for a couple of days and fed a diet of sugar syrup to make them more complacent. 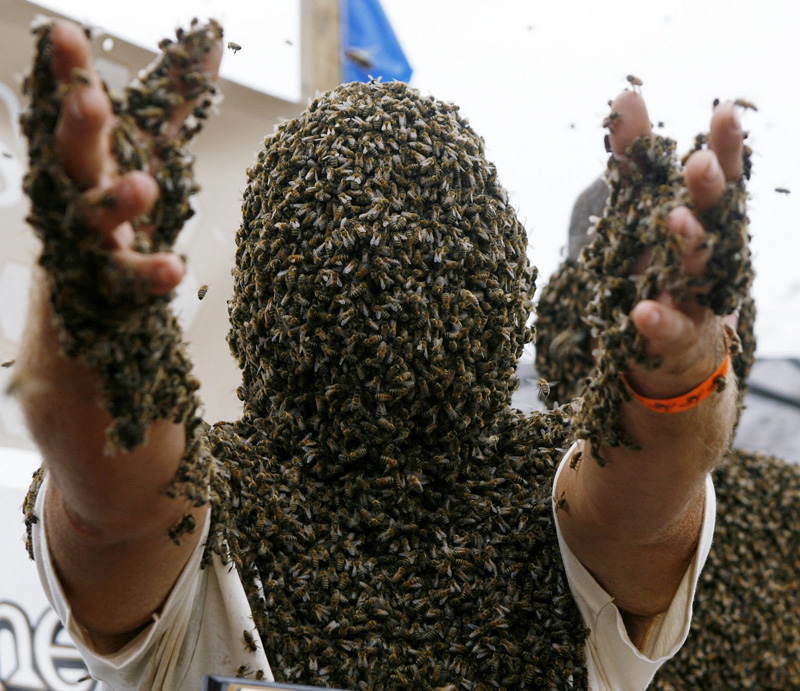 Many people who partake in bee bearding describe the sensation as one akin to little claws grasping at the skin. It’s important not to move very much while bearding, as the bees will cling that much more tightly to the skin. Once the show is over, though, the best way to remove the bees is to lean over the colony box, make like a lunatic and shake. 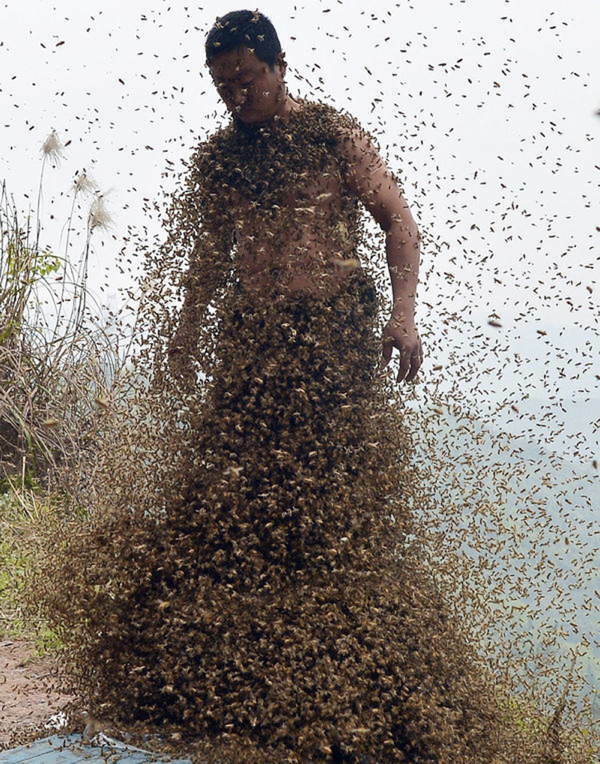 After the jerking motion causes the bees to drop like, well, flies, smoke is then sprayed around the bee bearder and the caged queen is removed from around the neck. 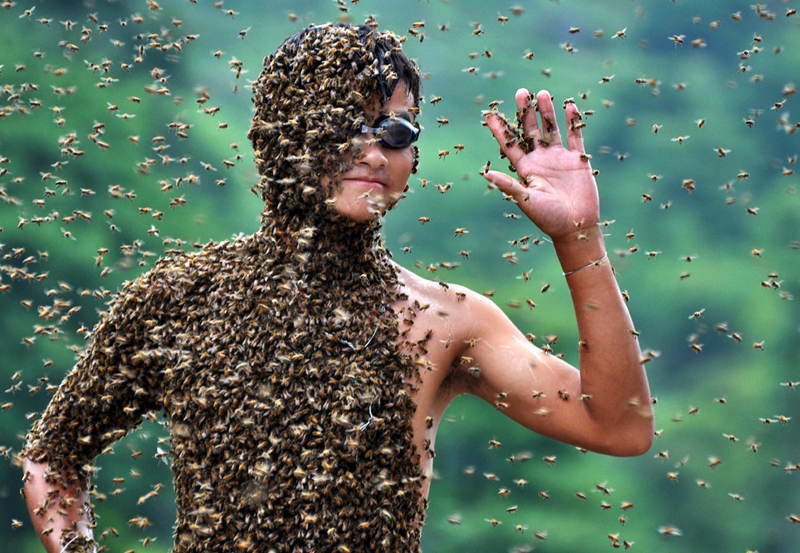 Because everyone deserves to feel like they are the best at something, The Guinness Book of Records includes a category for “most pounds of bees worn on the body”. 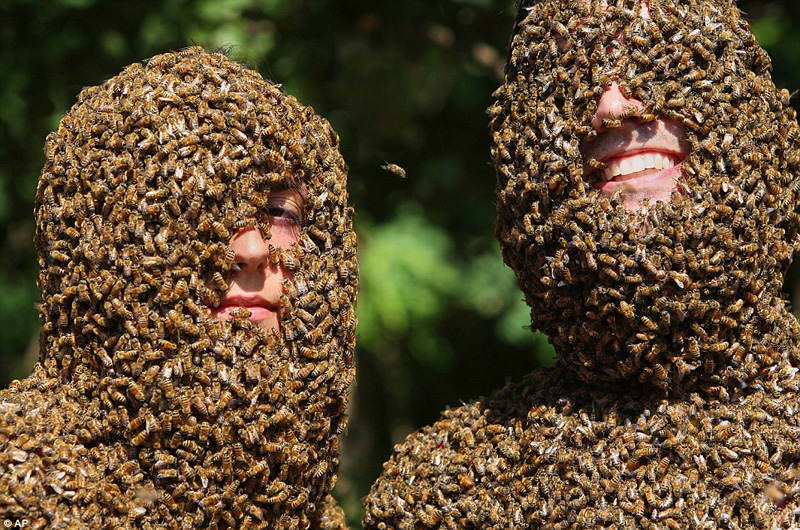 And in attempts to reach this record, ambitious bee bearders have turned to bee body suits. Most people cover their face, torso, back and arms to break the record. Currently, the record is held by Indian Vipin Seth, who has covered his body with 135 pounds of bees (around the weight of a newborn giraffe).